Fruits Shooter is FREE, best fun game and Addictive shooting bubblebuster game Fruits Shooter is the most classic and amazing fruitsshooting bubble buster game, is the most classic and new bubble popshooter fruits games 2017. Fruits Shooter is a very juicy arcadegame with beautiful scenery and fruits, fruits shooter is a wildlyaddictive match-3 shooting game. How to play 1. Tap where you wantthe fruit to go. 2. Make combinations of 3 or more fruits that havethe same fruit to make them burst. 3. Group 3 or more fruits tomake them pop. 4. Help to Squirrel to save her babies from bubbles--- POWER UPS ---- - Fire Ball - destroy more red balls for fill upa Fire Ball. Use it to destroy a big area from the balls. - SunBall - destroy more yellow balls for fill up a Sun Ball. Use it todestroy three small area from the balls. - Water Ball - destroymore blue balls for fill up a Water Ball. Use it to horizontaldestroying of the ball’s line. - Leaf Ball - destroy more greenballs for fill up a Leaf Ball. Use it for Vertical destroying ofthe balls. --- GAME ITEMS & OBSTACLES ---- - Main 6 gamebubbles - red, yellow, green, blue, violet and orange. - FireBubble - destroying big area - Leaf Bubble - vertical destroying. -Water Bubble - horizontal destroying. --- FEATURES --- - 10beautiful nature scenery - 4 cute pets to select and play -Rain/snow effect. - 4 Power Ups to fill up. - NO INAPP-PURCHASE. 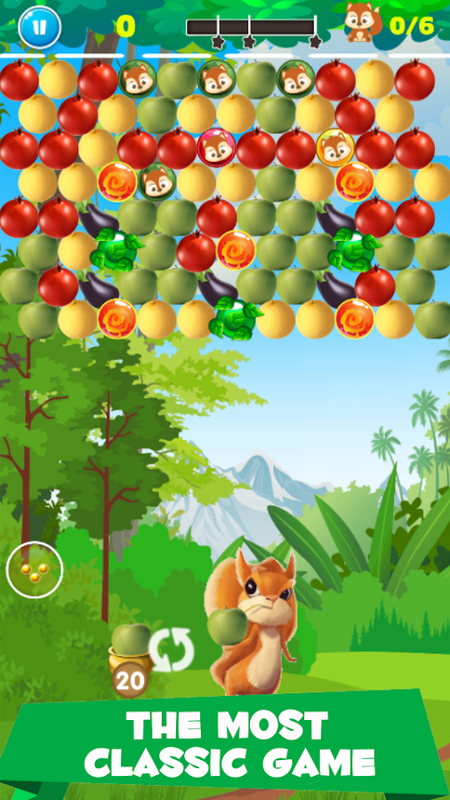 -FREE - Updated continuously Enjoy Fruits Shooter now. The best Archery game is now on mobile!Archery King is the hottest archery simulation 2D game foryou.Archery King delivers ultra realistic archery experience thatfeatures stunning 2D graphics, amazing animations and simpleintuitive controls.Great & free game to make you to be the archery master! Justaim and shoot, easy to play.Come and try your best to be the archery master!Challenge the Archery masters and be the Archery King in this 2DArcheryGame Features:- 7 locations: river, sea, mountain, forest, lake ...- Christmas updated.- Animation and realistic 2D graphics.- Challenge mode with 100+ levels- Master mode with more challenge.Download and play Archery King game, you will definitely enjoy itvery much. Extreme Trick Shot - a physics based puzzle game.You have a balland there is a box, the rule of this game is simple, throw the ballinto the box in one shot. Game have 150 levels for to beat, try tocome to the end, you will be surprised. Plan your every pop to rescue cute motu's baby! Pop the bubbles& blast through tons of different games on your adventure torescue the motu's baby! Pop bubbles and rescue motu's baby in thisfun Motu Pop bubble shooter game! Shoot and blast your way throughpuzzles to beat the evil baboon! Blast, match, and pop bubbles tohelp beat him & return the cubs to their worried mother!FEATURES: ★ 500+ levels with uniquely challenging obstacles ★ Usepower ups to make smart moves ★ Tons of fun & free Motu Popbubble shooter games and levels ★ Match 3 bubbles & filllanterns to create supercharged matches Get bubble popping on yourAndroid phone or tablet today…. Please Note! While Motu Pop BubbleShooter is free to play and enjoy, some in-game items and functionscan be can be purchased for real money.